BRISTOL SHOW 2010: Arcam develops sub-£300 standalone DAC | What Hi-Fi? What you see here is a hand-made prototype, although it gives a clear indication of what the production version will look like. It has USB, optical and coaxial digital connections, and a mains on/off switch on the back. The little silver button on the top allows you to toggle between the different inputs. 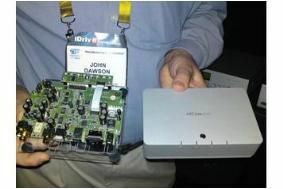 Dawson says Arcam has spent a lot of time and effort improving the performance of the USB connection. The unit is expected to go on sale this summer for around £299. Also on display on the Arcam stand here at the show is the Solo Neo wireless music streaming system, expected to sell for around £1400, and the £2500 AVR500 multichannel receiver, the younger brother to the AVR600.